New STEM OPT extension rules went into effect on May 10, 2016. Certain F-1 student visa holders in the Science, Technology, Engineering, or Math fields can now receive up to 24 months of work authorization after graduation — but may need to take quick action in order to remain eligible. 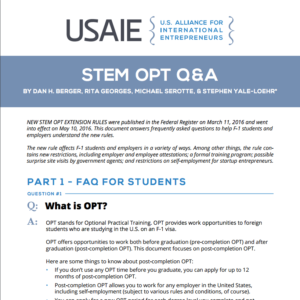 To help students and employers understand the new rules – and the thinking behind them – USAIE has put together a Q&A on STEM OPT, available here and free to share. how student entrepreneurs might navigate the new rules; and more. Of course, this general information does not constitute legal advice. If you have questions about STEM OPT, or any other topic related to work authorization and immigration, contact USAIE and request a consultation. We work with students, companies, and startup incubators. This entry was posted in News and tagged F-1 visas, Optional Practical Training, STEM OPT, Temporary (Non-Immigrant) Visas, Unauthorized Employment. Bookmark the permalink. ← What would happen to American entrepreneurship without immigrants?